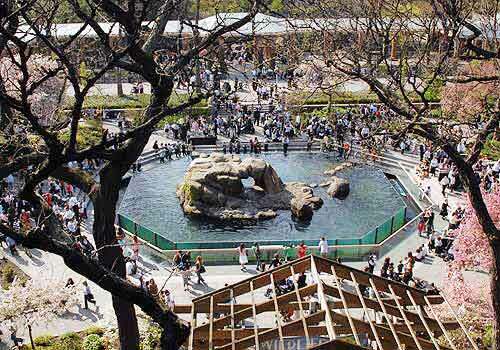 Central Park's new, state-of-the-art Zoo was built when the Wildlife Conservation Society took over the management in 1984. It showcases animals from tropical, temperate, and polar zones around the world. Restrooms are available with admission fee. A favorite with many visitors is the sea lion pool in the center courtyard. Its new design features glass sides so that viewers can watch these sleek carnivorous mammals gliding and spiraling under water. During feeding time (11:30 am, 1:30 pm, and 3:30 pm), the sea lions perform simple tricks for their meal. Equally fine is the lush perennial garden surrounding the pool, with benches tucked into corners. Of course, the nearby penguins are perennial attractions. Visitors can see vestiges of the old Zoo preserved in the new. Limestone reliefs by Frederick G. R. Roth of antelopes, birds, monkeys, lions, and wolves from the old animal houses have been incorporated into the new buildings. The newest addition is the Tisch Children's Zoo. Probably the most popular with the stroller set are the domestic animal areas around the perimeter. Here children can get close to goats, sheep, a cow and a Vietnamese pot-bellied pig. A quarter in one of the dispensers will buy a handful of nutritious food for the animals to nibble out of your hand. Small bronze sculptures of the animals stand next to each pen. When a child touches a sculpture it emits the appropriate cry or squawk. Also in the area are models of giant turtle shells, fish heads, and rabbit ears that demonstrate the mechanisms of sight, sound and body structure. In the center of the Children's Zoo is the Enchanted Forest. Artisans mimicked the colossal remains of primeval oak trees, acorns, and a giant spider. In the central aviary -- actually a complete habitat -- you will see live turtles and frogs along with birds. You'll also find one of the two children's theaters there. The other theater is in the central courtyard. A troupe of actors at the Acorn Theater in the Tisch Children's Zoo performs daily shows. Past shows include Eat Bugs and Metamorphosis Boogie. Between the main Zoo and the Children's Zoo is the George Delacorte Musical Clock, which is built on a triple archway of brick. On the north side of the arches are Frederick G. R. Roth's Honey Bear and Dancing Goat bronze sculptures dating from 1935. From 8:00 am to 5:00 pm on the hour and half-hour, one of 44 tunes plays while a bear with tambourine, a hippopotamus with violin, a goat with pan pipes, a kangaroo and offspring with horns and a penguin with drum glide around the base of the clock. In addition, on the hour two monkeys on the top of the clock appear to strike a bell. From about March 21 through June 21, the nursery rhymes are replaced by spring melodies such as April Showers, Easter Parade, Younger Than Springtime, April in Paris and It Might as Well be Spring. For the winter holiday season, from just after Thanksgiving to the second week in January, visitors can listen to such favorites as Winter Wonderland, Jingle Bells, Deck the Halls and Joy to the World.